Divine old American antique pine mesh cabinet. It has four bottom cabinets and two smaller ones up top. The most unique part about this piece is the shell shaped drawer handles. Beautiful black antique European hutch. 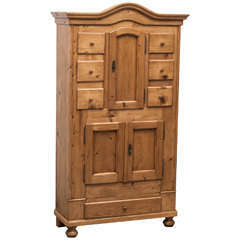 Has three door-like cabinets, metal accents, and rounded feet. Comes with original key! Simple and classic. A perfect fit for almost every space. A pair of vintage European side tables. White with rounded wooden tops. Beautiful for a bedroom. 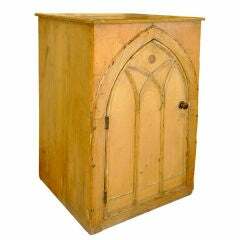 Charming and versatile storage cabinet fashioned from planks of pine with a single arched shape Gothic style door.<br /> <br /> Would be fantastic as a dry bar.